“Nutty Cream Cheese Brownie,” the November 2012 Flavor of the Month, is a flavorful combination of chocolate fudge ice cream swirled with a cream cheese ribbon, combined with walnuts and fudge brownie pieces. To celebrate her winning flavor, Kelsey visited Baskin-Robbins’ corporate headquarters in Canton, Massachusetts on January 31, where she worked alongside the Baskin-Robbins’ culinary team to create the very first batch of her new flavor. 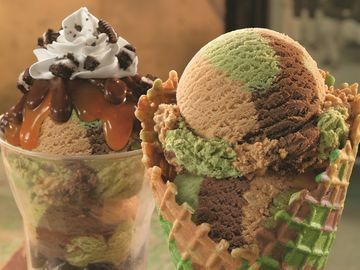 The Online Flavor Creation Contest began in October 2011 and asked consumers to mix and match their own ingredients to create a signature ice cream flavor from 31 base flavors, a variety of ribbons such as fudge and peanut butter and a copious amount of mix-ins including candy pieces and cookies. Ice cream fans voted for their top 10 favorite flavors and chose the winning flavor, “Nutty Cream Cheese Brownie.” For more information on the contest, please visit http://baskinrobbins.com/flavorcontest/. Named the top ice cream and frozen dessert franchise in the United States by Entrepreneur magazine's 31st annual Franchise 500® ranking, Baskin-Robbins is the world's largest chain of ice cream specialty shops. Baskin-Robbins creates and markets innovative, premium ice cream, specialty frozen desserts and beverages, providing quality and value to consumers at more than 6,600 retail shops in nearly 50 countries. Baskin-Robbins was founded in 1945 by two ice cream enthusiasts whose passion led to the creation of more than 1,000 ice cream flavors and a wide variety of delicious treats. Headquartered in Canton, Mass., Baskin-Robbins is a subsidiary of Dunkin' Brands Group, Inc. (NASDAQ: DNKN). For further information, visit www.baskinrobbins.com.